81 year young lady Marge Frisch (seen in picture above) could finally fulfill her desire on May 18, to scuba dive at Grand Cayman islands to explore the underwater world. 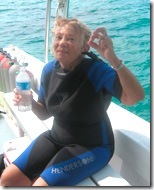 Here are the tips how she could manage to scuba dive at the age of 81. Here is an interesting video clip of scuba diving in Grand Cayman. More interesting information about Marge Frisch is available at caycompass.